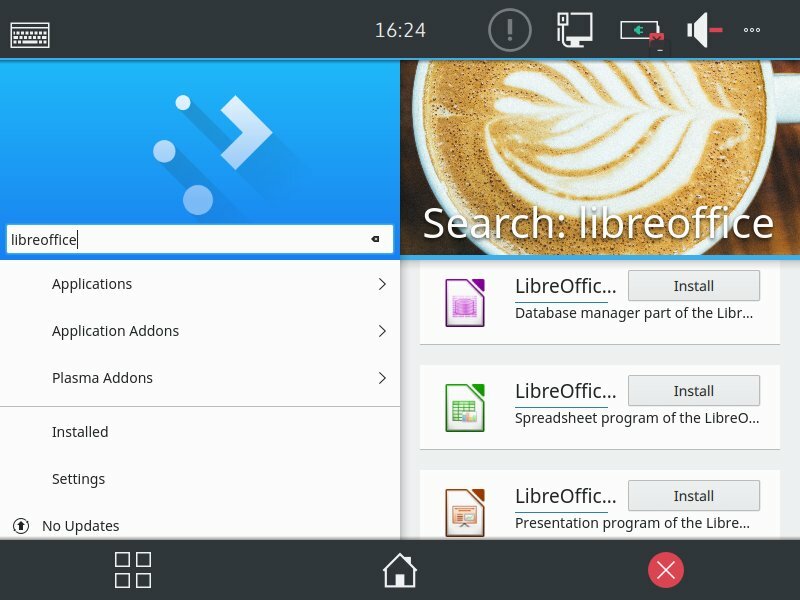 It is not every day that you hear news about Linux mobile. With Android (Linux not Linux) reigning supreme in the touch world, pretty much all and every partisan effort to break through in this space has gallantly and yet miserably failed. Remember Ubuntu Phone and Ubuntu Tablet? Ah, the memories. But then, a challenger appears. Wearing a Plasma cloak! Now, hold your horses, put the saddle of enthusiasm away and listen. Plasma mobile, in one form or another, has been around for about half a decade, and it is only now that we're getting an alpha version of a mobile product available for testing. Nevertheless, it is an important milestone in the Linux world, in the Plasma world, and in the mobile world. Hence, test we shall. At the moment, you can test Plasma on physical devices, but given its rough and early state, which means more teeth and bite than a rabid Tasmanian devil, you're better off giving it a spin in a virtual machine. 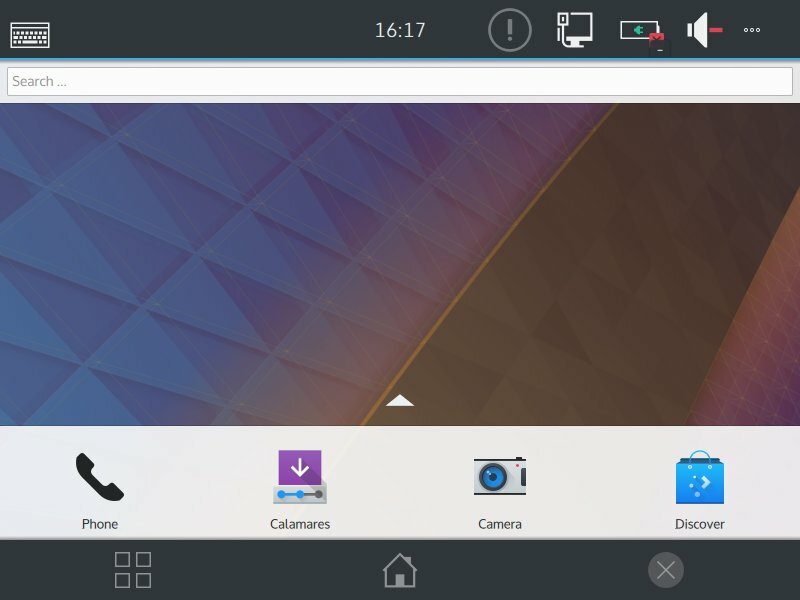 Indeed, the KDE team has provided ISO builds, titled KDE neon plasma mobile, which you can run in any which virtualization product. I have already tried touch products on x86 architecture - like Android x86, and while intriguing, it was never quite what it should be. There's a reason why form factors ought not to be mixed. So the expectations aren't mindblowing. With the ISO downloaded, I configured a virtual machine (Ubuntu based, like neon), and soon enough, I had the Plasma Mobile interface loaded. Along the way, words like Ubuntu and neon popped up, just as a reminded that this is still an early and incomplete product. The KDE DNA is undeniable. The looks are simple and pleasing, inviting. There are some odd visual glitches, like the persistent overlay minus sign icon over the battery meter, and the volume icon refused to change no matter how many clicks I tried. Pretty much any action that did work resulted in lots of horizontally flashing lines across the interface, which I presume are graphics artifacts due to incompatible drivers and whatnot. When I scrolled down to see what other applications are available, the slide increment is odd, resulting in partially cropped text, plus annoying transparency. The aesthetic side of things is very cool, but the OCD demons beg their sacrifice. Then, I tried playing with some of the available apps, just to see what gives. Discover launched fine, searched ok, then refused to install due insufficient permissions, i.e. sudo and whatnot. Hardly the best start for a tech demonstrator. Koko is some kind of an image gallery, which makes me wonder what Kirigami is. 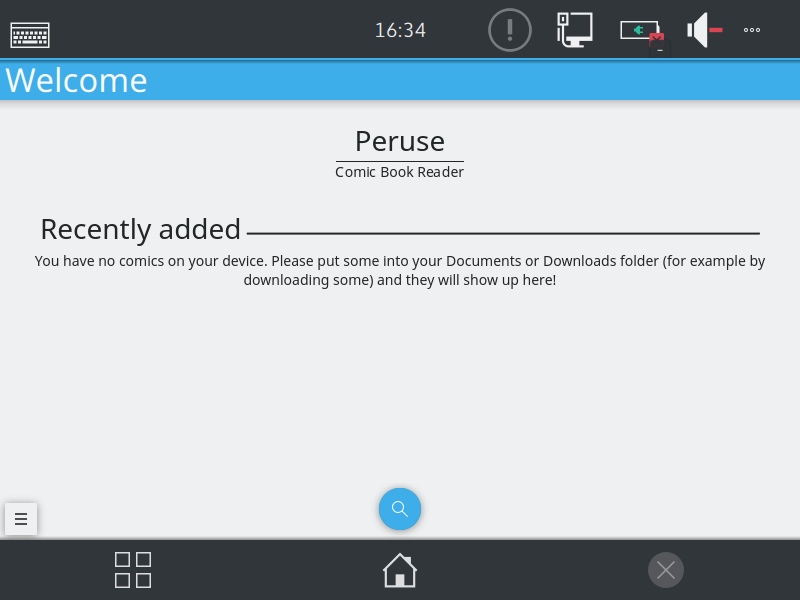 Peruse will show comic strips, only you need to load some on your own. Even a tiny little image strip would have worked fine. At this point, I have no idea how to actually "load" images onto my device, let alone do anything meaningful. Potentially, I could use USB pass-through and such, but that's just an unnecessary hassle that does not make Plasma any more inviting for use. 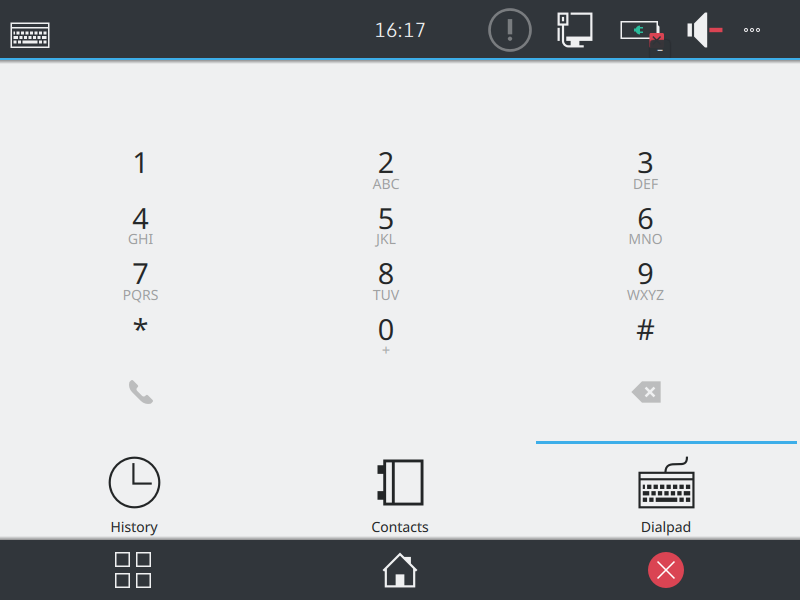 Dialpad is there, and it seems the most complete app overall. 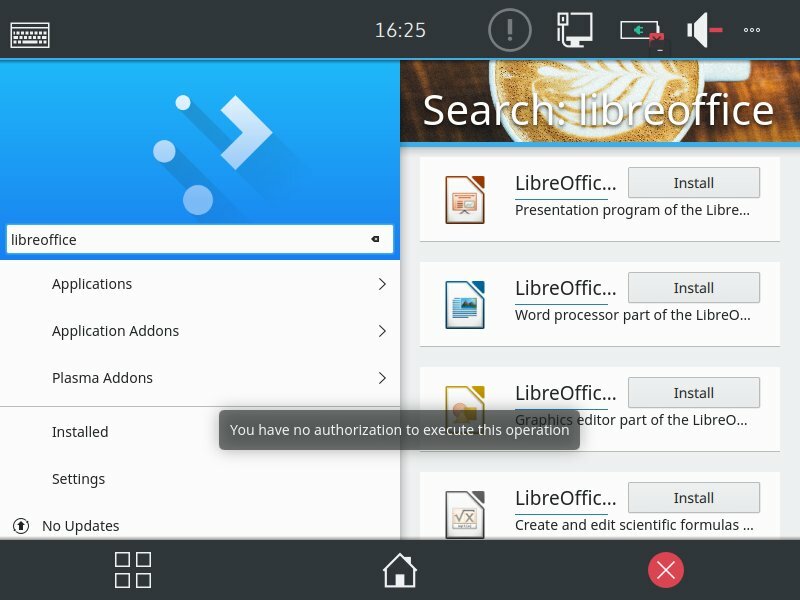 You also have the full Konsole if you want to do things the Linux way, but I guess that's missing the point of mobile. The virtual machine was barely usable. I had to reset the guest operating system probably a dozen times in thirty minutes. Sometimes, the screen would just go black, especially after closing an app. Sometimes, the system refused to go back, or launch the home screen. The UI was not very responsive, and there was a ton of lag. I know this is not indicative of how Plasma Mobile (will) behave on actual, physical devices, but it is still something to take into account. Looking forward, I already see two major obstacles ahead of Plasma. One, the current pace of development. There's no way Plasma Mobile will be able to achieve anything more than please a few nerds unless it picks up pace. Competing against giants will not be easy, perhaps even impossible, and I don't think there's an easy or cheap answer to that. The bigger issue is - applications. Even Microsoft, despite its multi-billion-dollar empire, failed to capture the mobile market, simply because it had no apps to support the operating system. Windows Phone was and still is superb, it's probably the best touch operating system per se, but that means nothing without all the stuff that plebes need. From the technical perspective, there's nothing wrong or missing with Windows Phone itself, or the devices, or anything of that sort. Microsoft nailed that. They just have no apps. Even with Nokia's ample help, it still wasn't enough. Plasma Mobile will mature into a complete system one day, and it will have its default set. All good. But then, people will want things like a native Facebook app and a native Google Maps app and a Whatsapp client and a Twitter client, and so forth. Dozens, hundreds and thousands of apps that exist and run well on Android, and whose presence must be replicated to give Plasma Mobile a remote but fair chance in this battle. In fact, Plasma Mobile needs a superior overall experience to make people even start considering the option of moving away from their familiar setup. So not just match Android. Exceed it. That's an even bigger unknown. I am really happy that Plasma Mobile exists. It's a natural continuation of an excellent desktop environment. But the technicals have never been a problem. Not so with Ubuntu or any other operating system. That's never the issue. The app ecosystem is all that matters. And that will take monumental effort and investment to achieve, if ever. The early tech demonstrator is an interesting project, but it's not dazzling enough yet to create sufficient interest in Plasma as a mobile platform. Matching the rivals is a zero-sum game. People already have Android and iOS. Those needs are met. But perhaps, Plasma Mobile can do more? After all, a tiny hobbyist kernel created in early 90s became the powerhouse of the modern Internet and cloud infrastructure. It's difficult to predict how well will Plasma Mobile do. Let's hope it will be more than a checkbox on an enthusiasm sheet of dashed hopes. Full power on, engage.